Save AED 10 (66.67%) – Earn 0 Shukrans What is Shukran? Shukran is the Landmark Group’s award-winning loyalty programme in the Middle East, which allows you to earn Shukrans when you shop any of our brands. 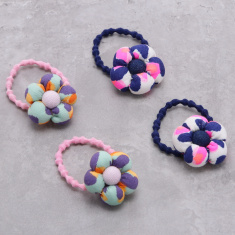 Spruce up your little darling's hair accessory collection with the addition of these trendy hair ties. Attractive in looks and stretchable in nature, these hair ties allow your little darling to try new hairstyles regularly and look gorgeous.